A position in gold stocks is often considered as a more convenient way of gaining exposure to gold than holding bullion. The rationale is quite intuitive: when the price of gold rises, the profits of the gold mining company should also grow, as well as the value of shares. And investors do not have to own any gold in physical form to gain in the price rally. Additionally, gold stocks usually offer leverage (this is not always the case and we invite you to check leverage of most important gold stocks and silver stocks using our investment tools), which is so adored by investors. According to Peter Tufano’s paper, the average mining stock moves 2 percent for each 1 percent change in gold price. Why does such leverage exist? The reason is that gold can be mined at prices lower than the spot price. Let’s assume that the costs of production are $600 per ounce, while the price of gold stands at $1200. A 1-percent increase in the gold price to $1212 will raise the margin from $600 to $612, which translates into a 2-percent jump in the mine’s profitability and possibly in the stock value. By the way, it should now be clear that the production costs (and mining supply) do not determine the price of gold as some analyst claim – instead, the price of gold leads the production costs. However, the gold stocks’ sensitivity to gold prices varies over time and across companies, as it depends on many factors: the level and volatility of gold prices or firms’ hedging. Some companies hedge themselves against fluctuations in the price of gold. If they lock in prices for upcoming production, the short-term profitability is not affected by changes in gold prices. Others producers (called junior miners, in opposition to senior miners) may not extract any bullion yet, as they only seek a gold deposit or develop one. 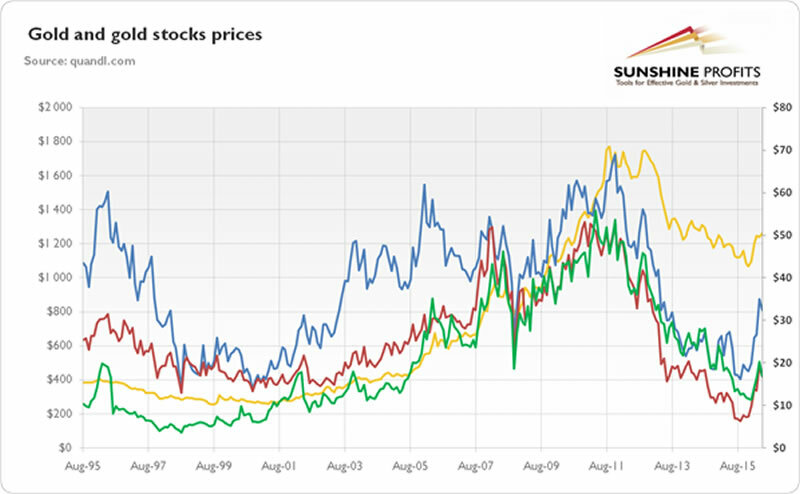 The significance of hedging on the stocks’ sensitivity to changes in gold prices is presented in the chart below, which presents the price of gold and chosen gold stocks. As you can see, Newmont Mining started to eliminate its hedging relatively early in the 2000s gold bull market – as a result, its shares performed better compared to its peers. Chart 1: The price of gold (yellow line, left axis, London P.M. Fix), the price of shares of Barrick Gold Corporation (red line, right axis), the price of shares of Goldcorp Inc. (green line, right axis), and the price of shares of Newmont Mining Corporation (blue line, right axis) from 1995 to 2016. Moreover, investors should also remember that purchasing gold mining stocks is not an investment in gold, but in a company digging bullion out of the earth. It implies that a position in gold equities may not always track changes in gold prices due to company-specific factors or trends in the stock market. For example, share values may not rise during a gold bull market because of a company’s mismanagement, strike or a stock market crash. On the other hand, thanks to hedging or diversified operations (a firm may also mine other commodities than gold) some producers may flourish during a gold bear market. Another important difference lies in the fact that gold-related equities can pay dividends, while bullion does not bear any yield itself (though that is not strictly true due to gold leasing). Stocks and gold should also react differently to macroeconomic factors, such as inflation, interest rates, business cycle or changes in risk premium. Investors should remember that gold behaves much more as safe haven during extreme market conditions, while systematic risk is much more negative for gold stocks than for gold. This is because gold stock returns may be broken down into gold price returns and market returns. This is why the leveraging offered by gold mining stocks is sometimes rather small and the “gold beta”, which measures the sensitivity of returns on gold stocks to changes in the price of gold, is not always very distant from unity. This phenomenon may be strengthened by the “clientele effect”, i.e. the fact that investors in gold stocks are often the same people who invest in gold bullion. Therefore, the shiny metal and stocks are correlated, but rebalancing between them limits the leverage of gold equities. To sum up, purchasing shares of gold mining companies is one way of gaining exposure to movements in the price of gold. However, it is not a perfect play on gold. Although gold stock prices are correlated with those of gold (see the chart 1), an investment in miner’s equity is a different kettle of fish. It is not a safe haven against market turmoil, but a bet on company’s operating earnings and the management team which controls it. Therefore, investors should remember that although in theory gold stocks provide a leveraged way to own gold, in reality many miners lag behind the bullion market. This is why investment in gold shares is very demanding and the key is to pick the appropriate gold stocks. If you enjoyed the above analysis and would you like to know more about the structure of the gold market, we invite you to read the March Market Overview report. If you’re interested in the detailed price analysis and price projections with targets, we invite you to sign up for our Gold & Silver Trading Alerts. If you’re not ready to subscribe at this time, we invite you to sign up for our gold newsletter and stay up-to-date with our latest free articles. It's free and you can unsubscribe anytime.